Revitalize & Re-energize with Style The resort is set in the lush rainforest hinterland where you’ll find serenity, seclusion and an escape from the stresses of city life. Each lodge has its own private balcony overlooking the freshwater creek that runs through the property or the surrounding rainforest. There is 1 room suitable for disabled guests. In this intimate environment you can indulge yourself with a massage, relax by the pool, stroll through the surrounding rainforest and later enjoy the superb food & wine at Wilson's by the Creek. ‘Wilson's by the Creek’ restaurant is open for breakfast, lunch and dinner 7 days a week. In the tradition of Peppers' reputation for fine dining and wine, Executive Chef, Michelle Hewitt, creates daily menus using the freshest local produce available in the Byron Bay region. Bedrooms & Bathrooms 1 Queen size bed, Double sofa bed in lounge. 1 Bathroom with shower. (5 lodges have bath & shower). Additional adult/child costs $65pn Important Information Please note that extra person rate applies for the use of Sofa Beds. Directions From Brisbane Proceed along the Pacific Highway, following the Ballina signs. After passing the Byron Bay exit (Ewingsdale Road), continue along the highway for approximately 3km. As you reach the crest of St Helena's hill, turn right into 'Coolamon Scenic Drive' Continue along Coolamon Scenic Drive for approximately 7km (this road becomes Coorabell Rd). Turn Right in to Newes Road and follow Newes Rd to the very end, continue past the "Peppers" sign and follow the driveway down to the main building to check-in at Reception. Directions from Sydney Travelling on the Pacific Highway (Highway 1) follow signs to Ballina At Ballina, follow the signs to the Pacific Highway ("Tweed Heads") Turn LEFT at the roundabout, onto the Pacific Highway, following the "Tweed Heads" sign. Continue on the Pacific Highway for approximately 20kms. As you climb St Helena's hill, prepare to turn left at the very crest, into Coolamon Scenic Drive. Continue along Coolamon Scenic Drive for approximately 7km (this road becomes Coorabell Rd). Turn Right in to Newes Road and follow Newes Rd to the very end, continue past the "Peppers" sign and follow the driveway down to the main building to check-in at Reception. 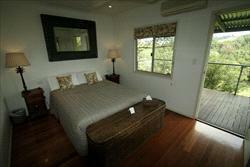 Peppers Casuarina Lodge is approximately 2 hours drive from Brisbane. 50 minutes drive from Coolangatta Airport via the new flyover. Airport transfers are available by phoning Byron Bay Taxis and Limousines on (02) 6685 5088 or calling (02) 6680 8726. Relax in your private Rainforest Suite amid stunning natural surrounds in the lush Byron Hinterland, enjoy a continental BREAKFAST for 2 daily. If the reservation is cancelled within 7 days prior to arrival 100% cancellation fee applies for the total stay.